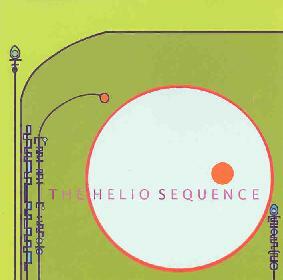 The Helio Sequence - "Com Plex"
The Helio Sequence finally arrives with their first full-length release after last year's CDEP "Accelerated Slow-Motion Cinema" and showcases the band's talents as pop-psych craftsman and instrumental space explorers. The 'band' is actually a young duo barely into their 20's. They are Brandon Summers on guitar and vocals and Benjamin Weikel on keyboards and drums. The promo sheet points out that the two engineered, produced, mixed, and mastered the album themselves. The album opens with "Stracenska 612". Pulsing guitar and electronica that is both floating and aggressive sets the pace for the song. The vocals, like moments on their earlier EP, remind me of an old John Lennon song and the guitar lines wail along nicely with the repeating mechanical electro beat. "Just Mary Jane (Calypso)" and "Transistor Radio are the two tracks from the EP that appear. They're pretty much the same as the tracks that appeared on the EP, but the sound is a bit fuller so maybe it was just recorded better for this release. The band's trademark sound of freaky synths bubbling and swirling about is evident as the guitars lay down a wall of sound backdrop and melodic licks. There's a guitar line in "Transistor Radio" that's similar to The Beatles' "Here Comes The Sun" that FEELS just great. So much from so little. "My Heart" is a soaring primordial stew of cosmic guitars and keyboards that provide the intro to yet another track that combines mind expanding psychedelia with an accessible pop sound. "Sassarfras" is like "Just Mary Jane" with the freaky synths dancing around in my head as the song carries me away on a cloud. "Tomorrow Never Knows" is a glorious rendition of The Beatles classic. Heavy guitars and totally spaced out synths pay an apt tribute to what may well be the greatest psychedelic song ever recorded. And "Demographics" reminds me a bit of XTC, though musically it belongs to Helio Sequence. It has that trademark full band Helio sound, but the keyboards are a little different having a playful feel that sounds at times like a vibrophone. I've long said that XTC were the true heirs to The Beatles and The Helio Sequence may yet challenge them for that honor. These lads have perfected the marriage of solid pop sensibility and musical and studio craftsmanship and certainly have plenty of time to learn and grow. Highest recommendation. Com Plex is distribted by Cavity Search Records. You can visit their web site.